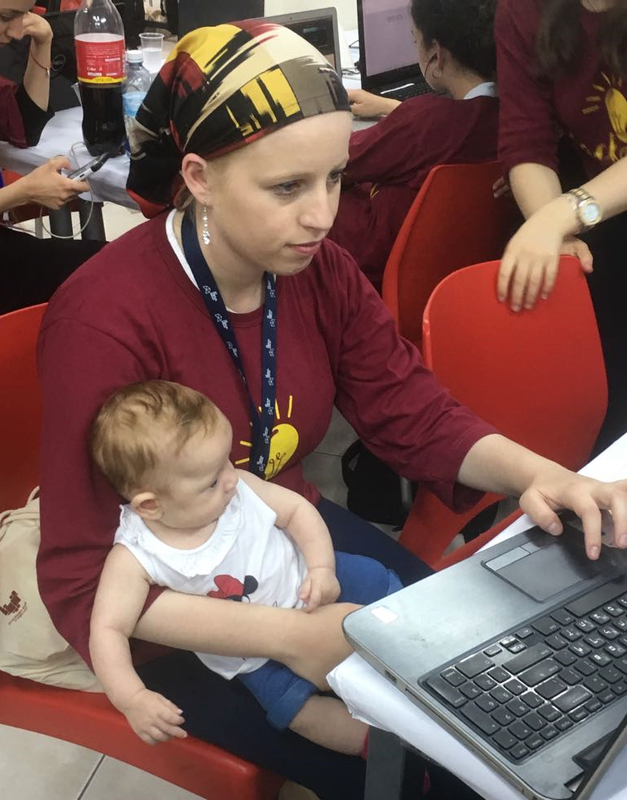 The Jerusalem College of Technology (JCT) held its first-ever hackathon for women in early June, with unexpected results. Far more women than expected turned out, several with babies in tow. The women’s commitment and interest were impressive, and the resulting projects far exceeded expectations. A hackathon brings together computer programmers and others in a compressed time period to work intensively in groups to create software. 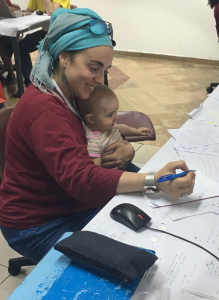 The strong response to the JCT’s hackathon, which took place over forty-four hours and involved 120 women working in groups of four to nine, has generated interest in the school’s entrepreneurship training program for women, which Targum Shlishi supports (read about the entrepreneurship program here). Below, JCT reports on the event, which was judged by industry professionals. Our Hackers and Hacker Moms! JCT–Lev Academic Center trains one out of every five female computer science and software engineering students in the country. The women’s campuses consist of Campus Tal and Campus Lustig. JCT’s student body is religious and ultra-Orthodox (haredi). However, although our students are highly-trained during their engineering and business degrees, members of the Orthodox and ultra-Orthodox communities have traditionally been underrepresented in the hi-tech entrepreneurship ecosystem. This is especially true of the women. They tend to work in programming positions where they are recognized for their skills, but do not normally work in product development or leadership roles, and do not believe they can create their own products or startups. As a result, the full potential of religious and Haredi women is not reaching the market and the country is missing out on potentially game-changing ideas. This year, the new JCT LevTech Entrepreneurship Program began operations to provide our students with the tools and the opportunities to innovate. The pre-accelerator program, LevTech LAB, offers access to both business and tech mentoring as they create products from A-Z. Not surprisingly, the number of women applying into the program was less than half of the number of students applying on the men’s campus. Seven women participated regularly in the first semester and five women in the second. The women are great but there are too few of them. Our goal in having a hackathon on our women’s campus was to provide an opportunity for the students to work on products in interdisciplinary teams over a short time period, forty-four hours, and to show them that they really do have what it takes. Companies like Intel, IBM, Rafael, and socially-minded startups and organizations provided great challenges, but, quite honestly, when we began advertising, we thought that maybe forty to sixty women would register. In fact, we had to close registration a day early when the number reached 120! Something about the short time period seemed to make it more doable to the women. The hackathon, which took place June 6-8, 2018, exceeded all of our expectations. Nursing mothers competed, holding their babies in their laps while programming. A group of first-year students who did not yet know how to program stayed up all night the first night learning how to code and ended up developing a web-based math learning program for children. We, and the judges, were blown away. They had never seen anything like it. The energy of the women, their willingness and courage to teach themselves brand new skills and then compete with them, their commitment to product development (including not going home and sleeping on benches in order to have time to complete their projects) was unbelievable. Suddenly, after the hackathon, the students realized that they didn’t want this to be the end of their products and came up to us in groups and asked how they could join the pre-accelerator. Our goal now is to see how we can work with other companies and organizations with like-minded ideas to improve the pre-accelerator program, in terms of infrastructure support, mentoring, speakers, and more, both on our men’s campus and our women’s campus.